Light for Art, a sector in the El.En. 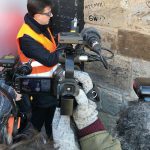 group specializing in laser systems for the preservation and restoration of art works, combines the group’s philosophy oriented towards new technological challenges with the reclaiming of artistic traditions of the past. The growing need to preserve the cultural heritage is causing a rise in the demand for increasingly accurate cleaning techniques, featuring high selectivity and low impact and El.En. has designed tools that give art the light for art laser – technological answer to art restoration original beauty that time and pollution has concealed. The main field of application of laser cleaning has always been, from the earliest pioneering evidence, that of stone materials in which the laser is a consolidated reality. In recent years the use of lasers has been extended, thanks to absolutely satisfactory results, to the cleaning of metals (in particular of gilded bronzes) and wall paintings. Further experiments are also carried out on silver, ceramics, wood and textiles. • Minimal invasiveness. 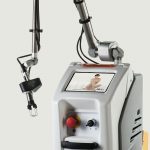 The laser is characterized by the absence of physicalcontact between the instrument and the surface to be treated; it does not require the use of chemicals or of abrasive materials. • High degree of control. The removal of the degradation layer affects only a few microns thickness per pulse. 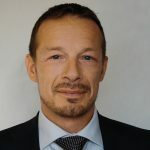 Selectivity: materials absorb the optic radiation of solid-state lasers according to their color, which makes the action of the laser even more selective. • High precision. The cleaning process affects only the area illuminated by the laser beam, which may be defined depending on the actual needs. There is no effect on adjacent materials. El.En. 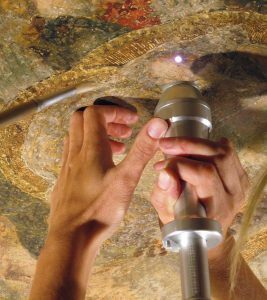 laser systems have been used for the restoration of the main italian and international masterpieces as Baptistery of Florence, Cathedral and Tower of Pisa, SS. Sepulchre in Jerusalem and much more. Actually, the hybridisation of El.En. Group knowledge (from one art restoration segment to medical field) make this group one of the most considerable and important worldwide.